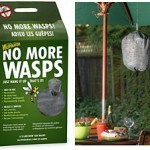 PRODUCT DESCRIPTION: The Waspinator sends a message that your outdoor area is already inhabited by wasps which will effectively encourage other wasps to stay away due to their natural "territorial" instincts. 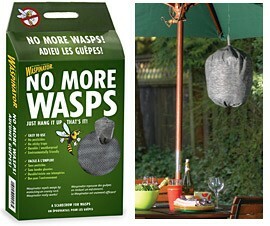 Portable and easy to use, the Waspinator is ideal for backyards, picnics or beach barbecues. Enjoy a wasp-free environment wherever you go outside as it's portable and easy to bring afield. The Waspinator is an environmentally friendly, non-toxic, and pesticide free visual repellent to keep unwanted nesting and foraging on or around your building. It involves no chemicals or messy bait. Keep in mind it does not kill wasps; it's simply a repellent and designed to promote a wasp free environment where installed. WHERE TO USE IT: Anywhere outdoors where you want to enjoy yourself without the worry of wasps; one per 1/4 acre for yard protection.